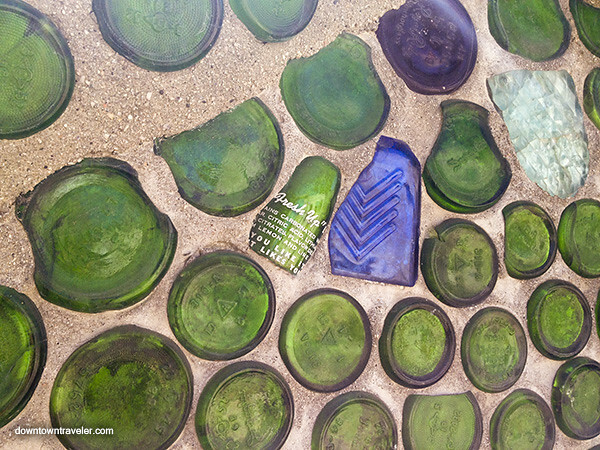 LA’s most creative work of art isn’t in a museum or the home of a Hollywood art collector; it’s in South Central. 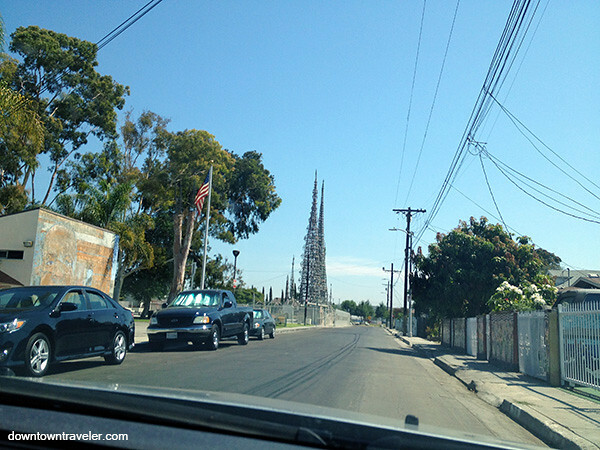 Yes, that South Central– the inner-city area immortalized in 1990s gangsta rap lyrics. 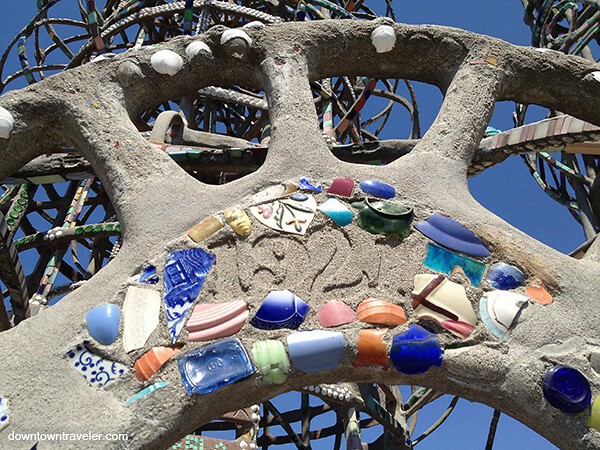 The Watts Towers bring an unexpected burst of color to Watts, a neighborhood known for 1965 riots and not a typical destination for Los Angeles visitors. 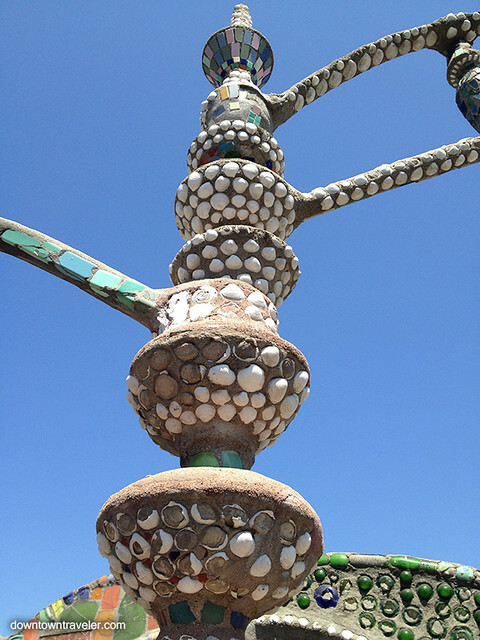 These unusual spires were the work of one man, Italian immigrant Simon “Sam” Rodia, who spent 30 years creating a backyard masterpiece out of scrap metal, broken bottles, tile, sea shells and other found objects. Amazingly, he created the structure without scaffolding or even a master plan. 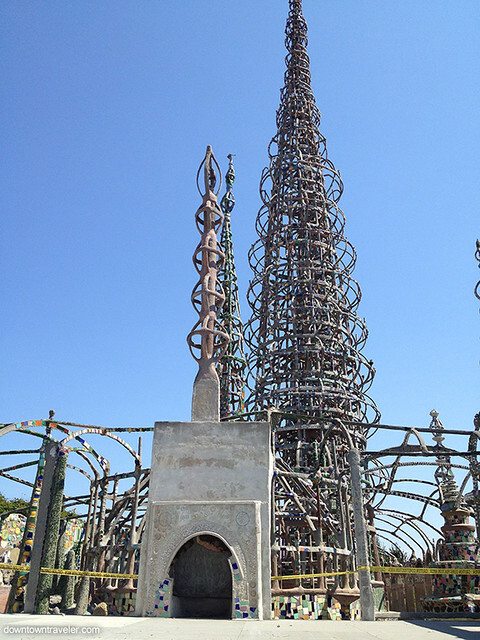 Rodia did not have a formal education and was certainly not trained as an artist; born on a farm in southern Italy, he came to the US at 12 and worked in a variety of professions (coalminer, tile worker) and, per our tour guide, formed and abandoned a family, battled alcoholism and spent time riding the rails before landing in Watts. 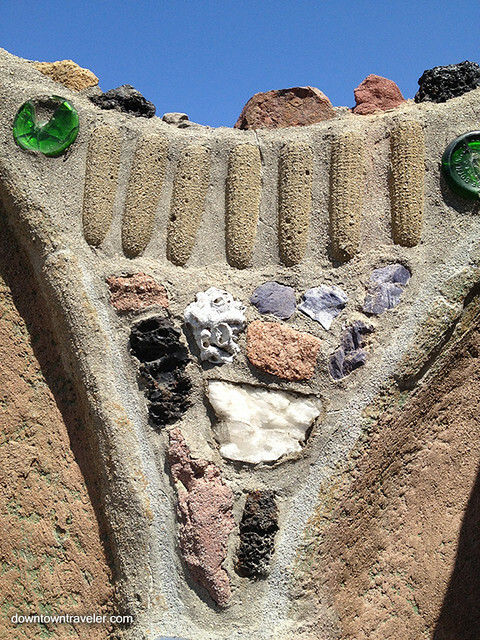 He purchased a unique triangular plot to realize his artistic vision. Rodia worked on the towers well into his 70s, continuing to climb up the metal structures with a bucket of broken tiles and homemade cement. 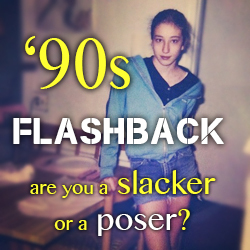 He did not consider hiring a helper, since he did not have time for training and was essentially broke. 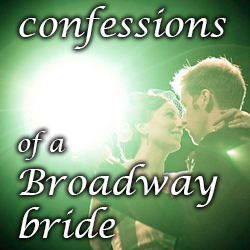 In 1954 he abruptly quit the project, gave the property to a neighbor and left town; he never saw his towers again. 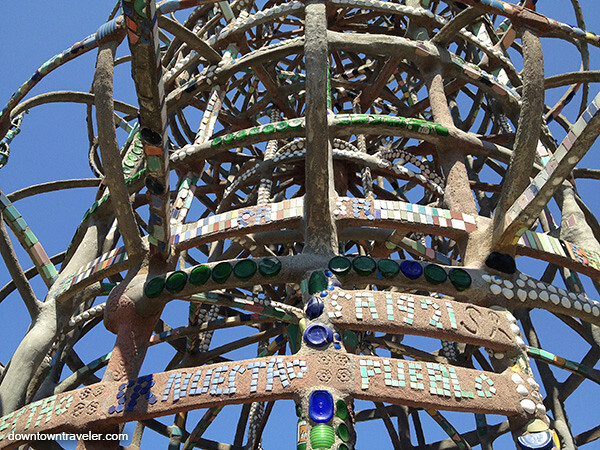 While the Watts Towers resulted from the dream (or obsession) of one man, they have become an important part of the community. In fact, the project was named “Nuestro Pueblo” (Spanish for our town) by creator Sam Rodia. 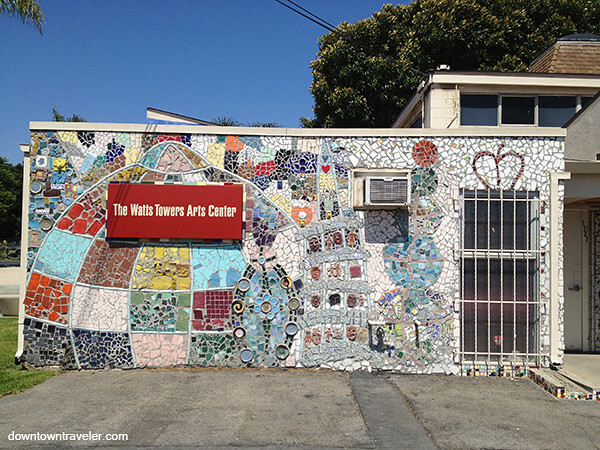 Now recognized as a National Historic Landmark and State of California Historic Park, the Watts Towers site has grown to include an educational art center and a gallery showcasing local artists. 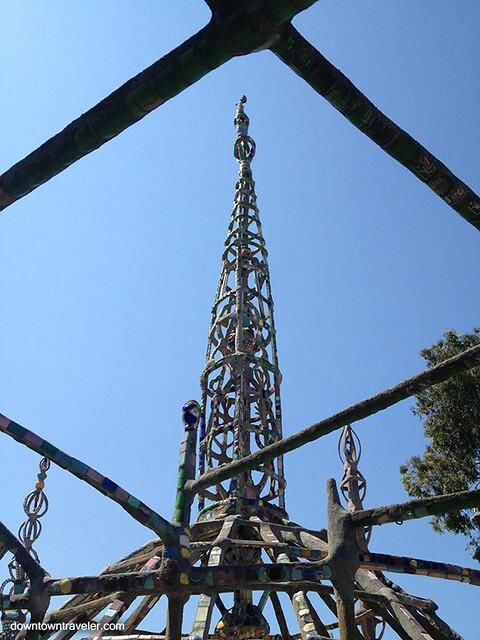 The Watts Towers are open to the public and tours are included in the $7 general admission fee. 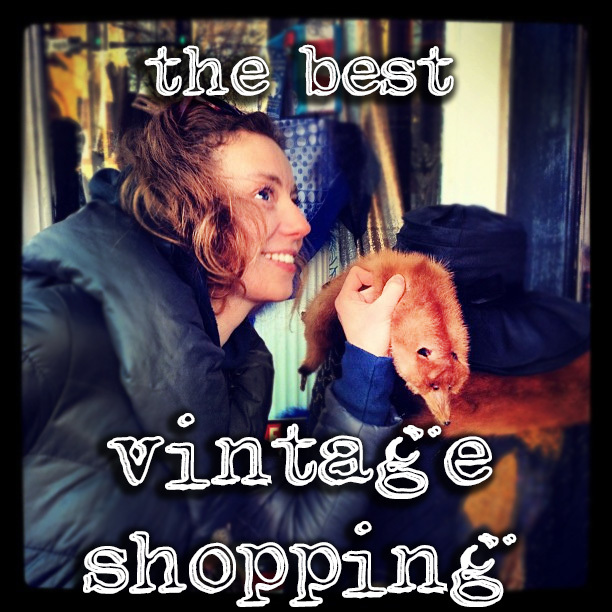 (Scroll down for details). During a visit this September, our tour guide, James, recalled climbing the towers as a boy. He claimed he reached the top– an impressive feat, considering the tallest spire is 99.5 feet tall! 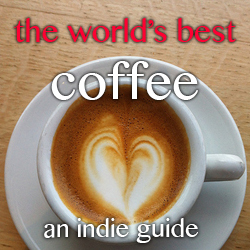 According to James, Sam Rodia was well liked by the community and was an all around “nice guy”– which undoubtedly helped him continue his unusual backyard project for three decades without interference. 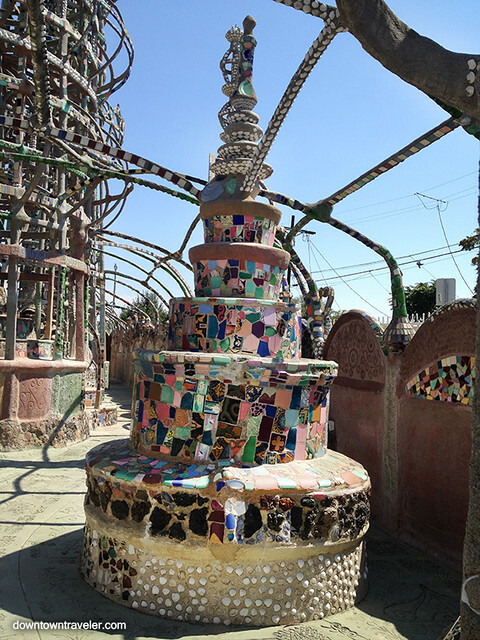 The Watts Towers consist of three tall, skinny spires, a stove, a fountain and several smaller structures, all created from hand-formed metal, cement and discarded objects. The lot is surrounded by a colorful fence, made in the same fashion. 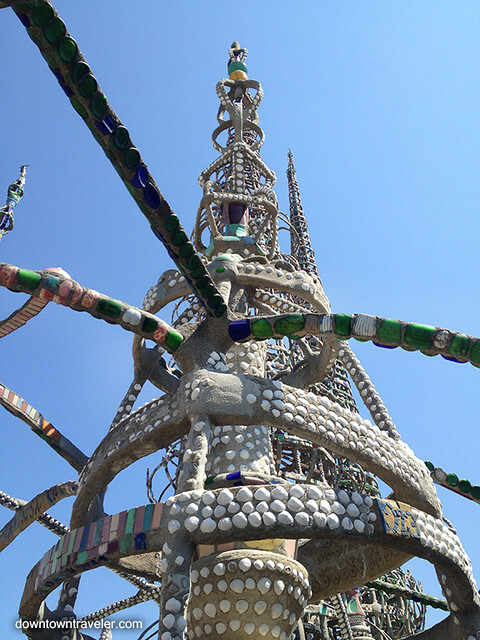 From a distance, the Watts Towers look like harsh metal structures; the intricate mosaic detail is only visible once you reach the gates. 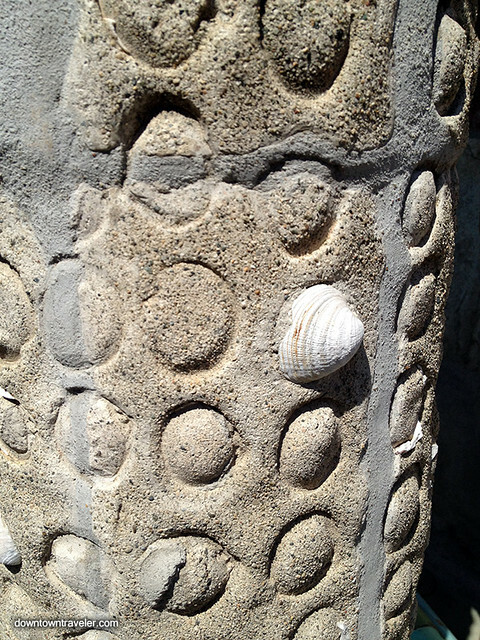 Admirers have drawn comparisons between the towers and the work of Catalan architect Antoni Gaudi. 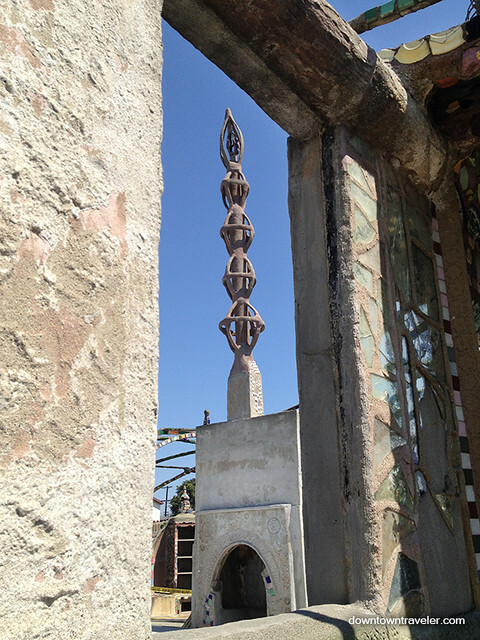 While their styles are similar at first glance, Watts Towers creator Sam Rodia was more likely inspired by the towers erected for festivals in Southern Italy. 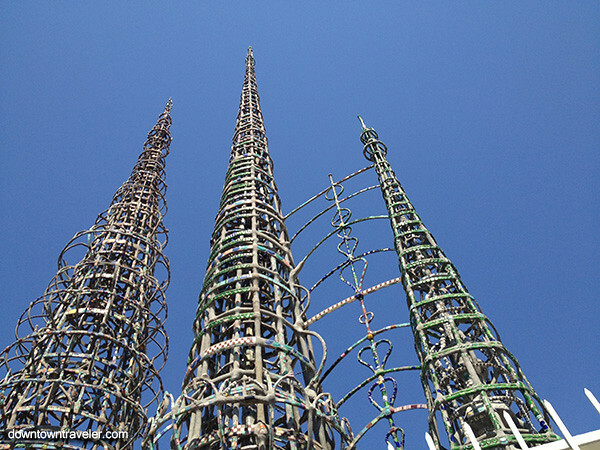 Rodia’s work is all the more impressive considering his lack of architectural training and welding skills; all of the towers’ joints are formed by wire wrapped around metal beams and covered in concrete. 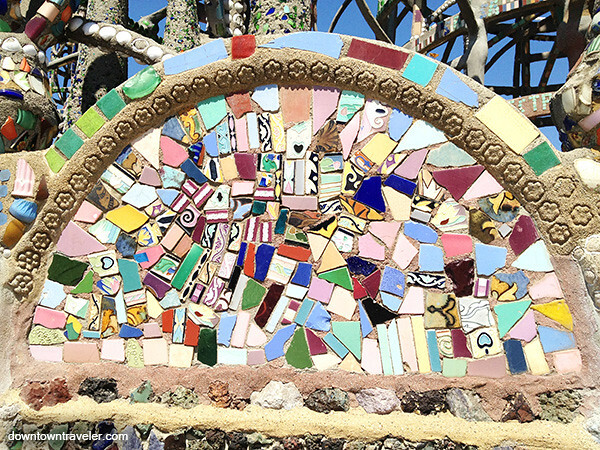 The Watts Towers are reminiscent of another mosaic project by an outsider artist, the Magic Gardens in Philadelphia. As James led our small tour group through the towers, he shared details of the artist’s life and process that were not included in the 12-minute video shown to visitors. 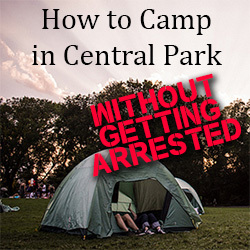 (The documentary was filmed in the 1950s and includes remarkable footage of an elderly Sam Rodia shaping scrap metal on a train track). 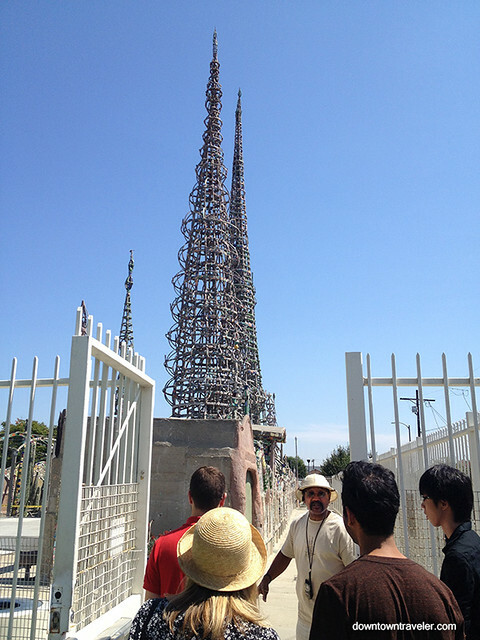 Having grown up in Watts, James offered a unique perspective on the towers and was able to show its impact on the surrounding community. He also provided more information on Charles Dickson, the South LA artist whose retrospective was on show at the on-site gallery. 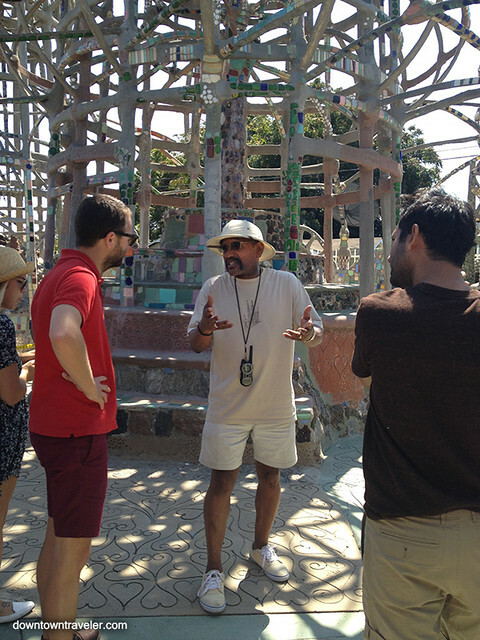 To understand the scale of Sam Rodia’s vision, you have to visit the Watts Towers in person. 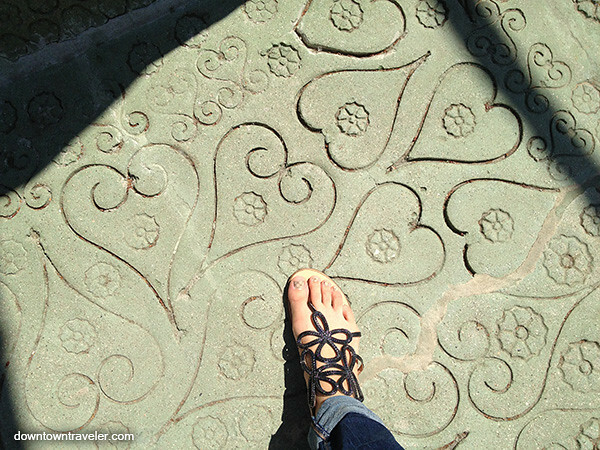 You’ll marvel at the heart-shaped patterns that are lovingly carved into the cement walls and floor, and can see the full range of unusual materials (from corn cobs to 7-Up bottles). 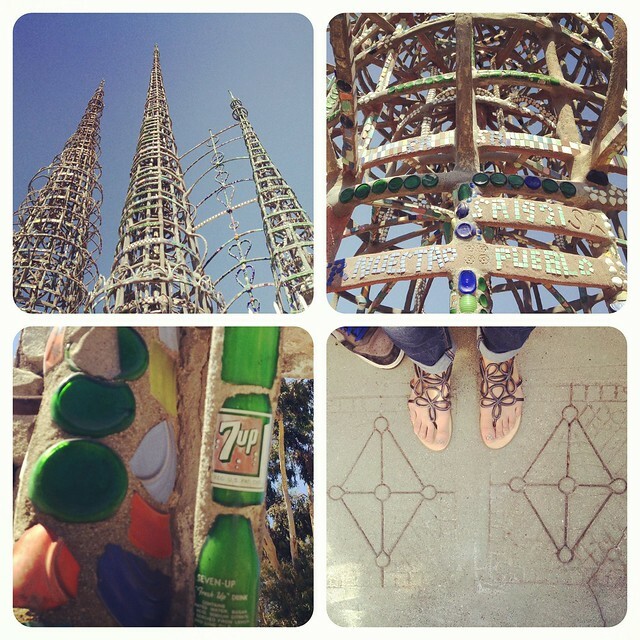 Scroll down for more photos of the Watts Towers– and make sure to plan a visit on your next trip to Los Angeles! 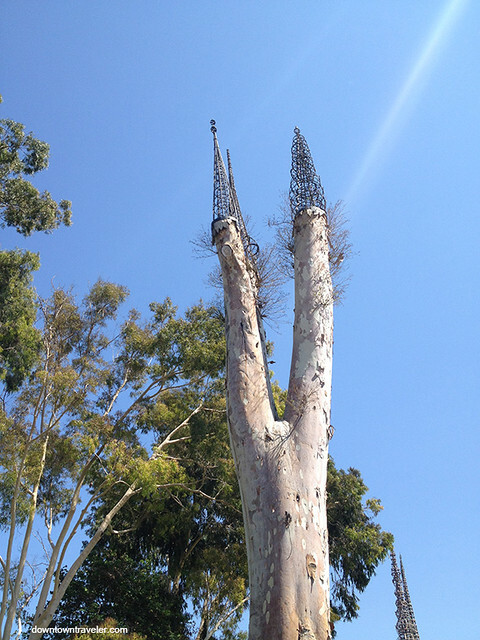 A more recent sculpture paying tribute to the Watts Towers, located next to the site. 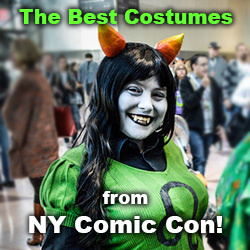 Cost: $7 general admission; $3 for seniors and youth; FREE for children. 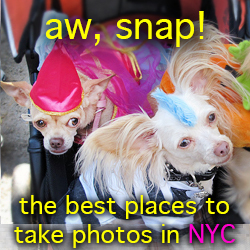 Group tours are included in the admission fee and leave the welcome center every half hour Thursday through Sunday. 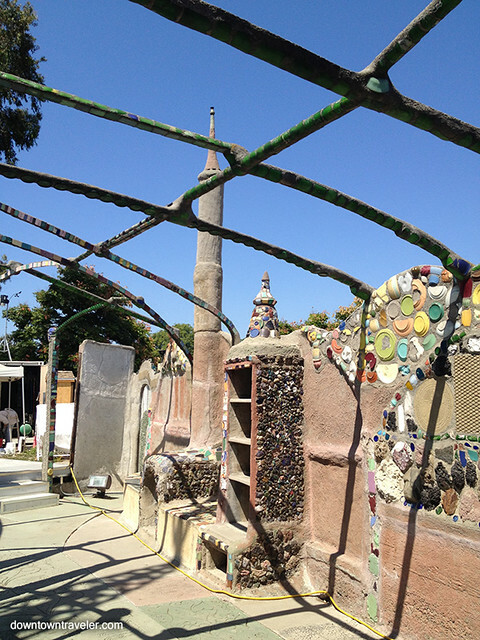 For more info: Visit the semi-official Watts Towers website for hours and additional details on the artist and site. 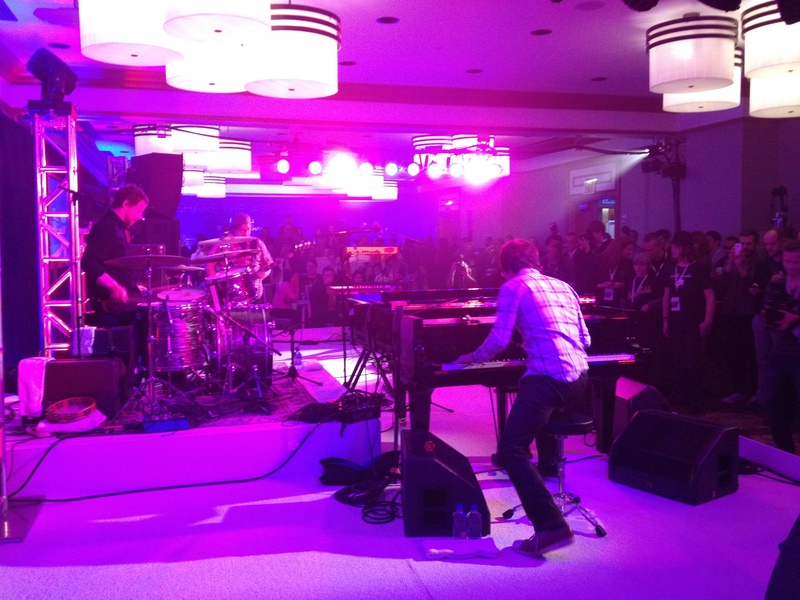 That is one funky, but very cool tower! Nomadic News: Has the ultimate carry-on bag just been built?